Style Me Up Style Me Up i-Loom Starter Pack Only $36.00! Down From Up To $102.00! You are here: Home / Great Deals / Style Me Up Style Me Up i-Loom Starter Pack Only $36.00! Down From Up To $102.00! Sears has this Style Me Up Style Me Up i-Loom Starter Pack on sale for $36.00 (Reg. $102.00)! Learn, make and share countless possibilities of friendship bracelets with the i-loom Starter Pack by Style Me Up. Use the device to set up your materials and keep them organized to maximize your knotting. Download the Premium i-loom App included in the set to learn various knotting techniques and complete simple to complex projects. Browse and choose from an ever-growing library of bracelet i-Patterns or create your own using the unique Pattern Creator. Visit the app to unlock up to 5 i- Patterns including Always Chevron and Jagged Arrowhead. Each Starter Kit includes 6 spools of colored string, numbered spool tags along with 3 basic and 2 deluxe locks to help you complete your creations. 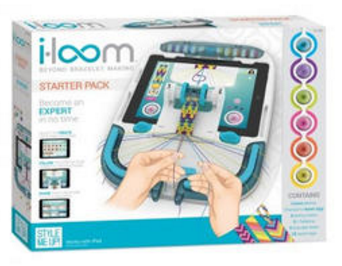 i-loom is the ultimate experience for both beginners and experts – i-loom lets you go beyond bracelet making! Contains: i-loom friendship bracelet device, 6 spools of different colors, Full premium/ad free iOS i-loom app, 5 i-loom bracelet locks, 18 spool tags, 5 i-patterns to use in i-loom app, Installation instructions. Learn, make and share countless possibilities of friendship bracelets with i-loom Device & App.